Beef: it doesn't have to be what's for dinner. Gator, squab, elk, and more hunt-able fare (aka game meats) are just a few of the flavor-packed proteins the following restaurants have been kind enough to put on their menu. So put down that burger (unless it's ostrich) and feast your eyes on some mouth-watering examples of animals you maybe haven't been masticating, but definitely need to. What’s it like: Often called the “whitefish of the desert,” rattlesnake’s taste resembles tilapia, but its texture is stringy and tough. 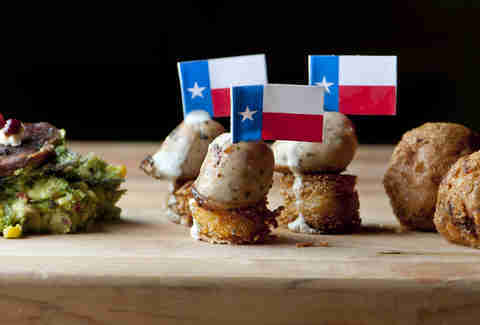 By grinding the meat into sausage, this dish overcomes rattlesnake’s sinewy shortcomings. What else you should know: Not only is this serpent snack protein-packed, it’s also a relatively low-calorie one (about 93 cal/100 grams of meat, half as caloric as sirloin steak). What’s it like: Elk tongue tartlets are made with figs, blackberry brandy, and walnuts. Elk is a thick red meat, which tends to be tender, but especially so if it’s grass-fed and played “Careless Whisper” on a loop. What else you should know: Elk meat is so tender and full of flavor that most recipes suggest you avoid marinating it all together. It’s also lower in cholesterol than chicken, beef, lamb or pork -- even bison. 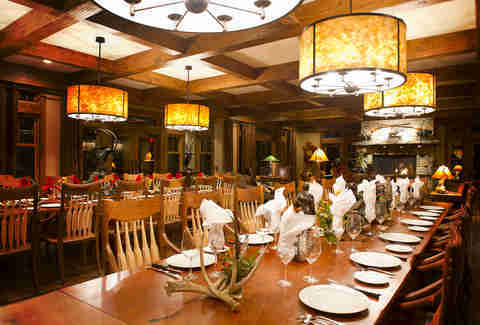 Also, Kessler Canyon is a hunting ranch, so you can meet your meat at gunpoint, if you're so inclined; they also have a billiards table. 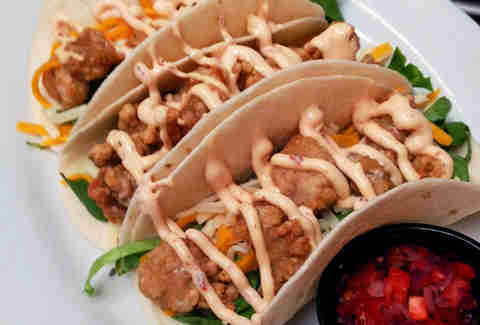 What’s it like: You get three soft-shell tacos with lettuce, shredded cheddar-jack cheese, plus their homemade chipotle mayo and pico de gallo. The gator can be blackened, fried or grilled. Captain Hook’s mortal nemesis not named Peter has a tough texture like steak. What else you should know: The Black Hammock is right on big ol' Lake Jessup, so there are often gators around off-plate. 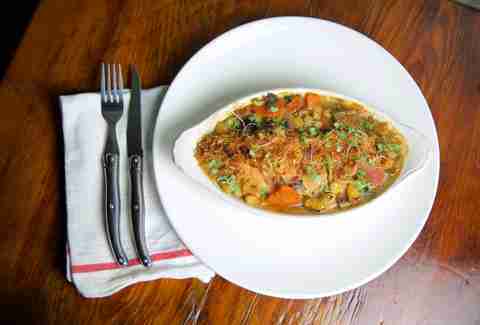 What’s it like: Rabbit sausage, arabais beans, shallots, carrots. As rabbits are compact, athletic animals, their meat is tough and lean, and surprisingly sweet tasting. What else you should know: When a rabbit is happy, they perform a particular jump-and-spin gesture called a “binky.” And if Watership Down is any indication, when they are angry, they form a despotic police state. What's it like: ‘Roo meat is very tender, so long as it’s not overcooked, and is exceptionally lean: there’s no fat to speak of. 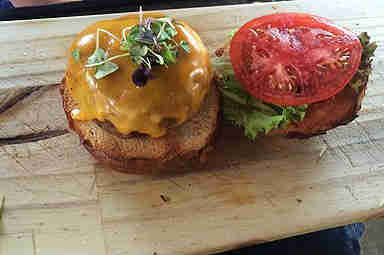 This bouncy burger comes with greens, cheddar, and tomato jam on a pretzel bun. What else you should know: In Australia, “Kangatarians” limit their meat choice to just 'Roo, arguing that eating kangaroo meat has a lower environmental impact than commercially produced livestock, as it requires no extra land or cultivation. 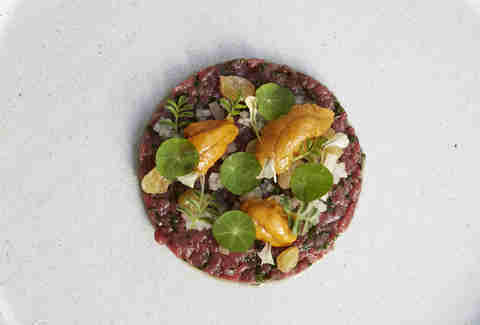 What’s it like: This sophisticated dish features uncooked venison sourced from New Zealand, prepared like tartar, and topped with bits of Uni and white raisins. 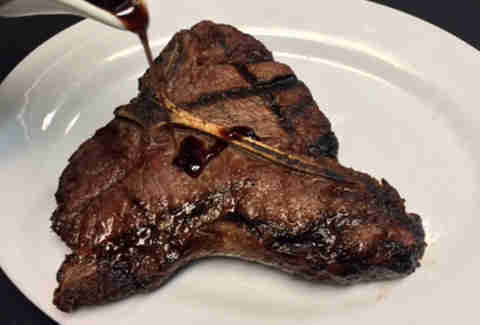 The meat is rich, soft, and possesses a pungent bite, sure to delight foodies and Neanderthals alike. What else you should know: Between 2011 and 2012, there were 1.4 million deer-vehicle collisions in the US, which led to more than 4 billion dollars in damage. So, please eat more of them. 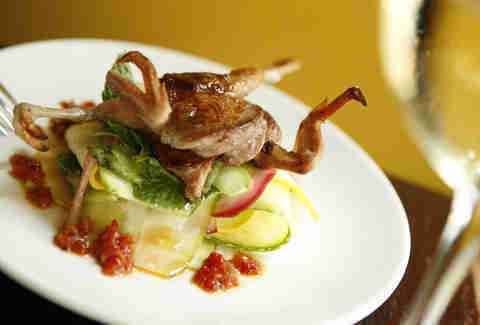 What's it like: Quail tastes somewhere between chicken and duck, in terms of how strong the flavor is. This dish is served in a walnut beet pesto. What else you should know: While three ounces of chicken is around 210 calories, the same amount of quail has a hundred fewer. Quail also has 25% of the daily recommended amount of phosphorous, which is good for us. What’s it like: Ostrich meat is red and succulent, decidedly unlike chicken and other fowl. 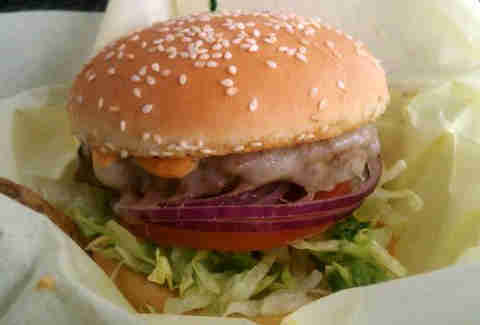 Red Rum’s version is a standard burger re: the fixins. But while ostrich tastes a lot like beef, it lacks the deposits of fat marbled throughout. What else you should know: Ostrich meat has 84% your daily requirement of B12, which we think has to do with brain function, but we ate a regular burger and we forgot. You can also eat their massive eggs, which are roughly the size of 25 chicken eggs. 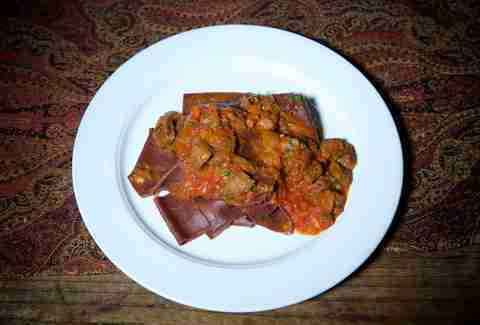 What’s it like: Wild boar is dissimilar to pork in both texture and taste. Boar is chewier, but satisfying and steak-like, rather than tedious like bad calamari. Boar has a stronger taste, somewhat smolder-y, which compliments the tangy pasta in this dish like whoa. What else you should know: If your standard pig gets into the wild, it goes hog-wild, sprouting tusks and fur within a generation. While we might call these "boar", they're not the same species. Babbo serves genuine boar that's farm-raised from European stock. What’s it like: While a single squab doesn’t yield much meat, the small portion has a big, rich taste, a buttery texture, and crisp fatty skin. 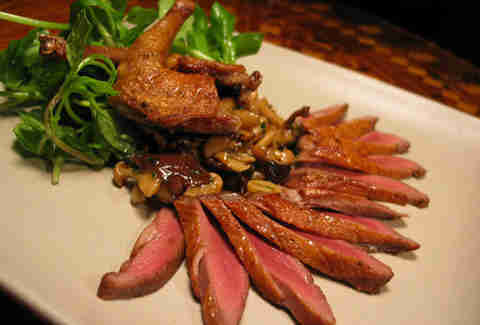 What else you should know: Squab is actually (young) pigeon. So like bird lamb. Don't worry, nothing you eat is coming from sidewalks, and pigeon has been domesticated as livestock since Ancient Egypt. What’s it like: A 14 oz. 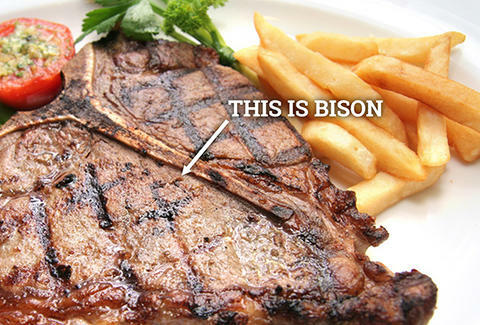 T-bone of bison meat has a subtle flavor, but its texture is less chewy than steak. If you have the option, make sure to order it on the rare side, as overcooking a meat this lean will ruin it. Just leaning on it would also probably ruin it. What else you should know: In addition to the 400 pounds of meat they could harvest from a standard bison, Native Americans fashioned horns into cutlery, stretched sinew into bowstrings, boiled the hooves for glue, and burned their dried dung for fires... though the “using every part of the bison” thing is cliché and lies, because c'mon -- you don’t even use every setting on your microwave. What’s it like: Unlike the Raw Venison (no. 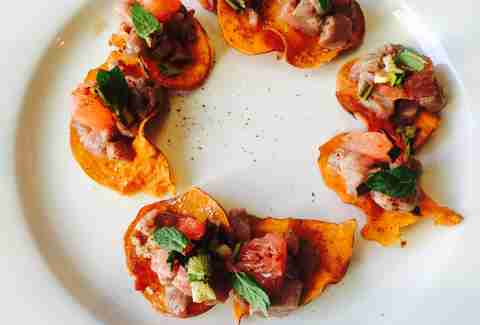 6), this dish isn’t exactly raw, as the citrus-soaking in ceviche work to “denature” the meat, which is a Mr. Scientist way of saying it breaks down proteins the same way heat does. Already noted as exceptionally tender meat, elk prepared in this fashion gets practically silky. What else you should know: The flavors and cooking techniques best suited to elk actually more closely resemble how you'd treat a hunk of beef, rather than deer, elk's less rustic cousin.